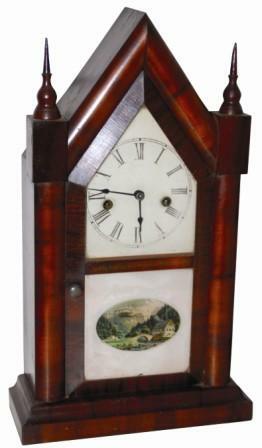 Waterbury Clock Co. "Sharp Gothic", ca 1881. Plain old steeple clock to most of us, this one in near perfect condition except for a replaced bob and a tip broken on the points. 19" mahogany veneered case is very nice, rounded edge around the front, slanted door frame, good glasses, door knob, fine metal dial and hands. Complete label inside, coil gong and Waterbury's one day brass movement that is running briskly. Ly-Waterbury, page 404.